Wow this is cool news! Anthropologie asked me to do another event in-store so here I come - this time it's in the midwest! Yippee! I'll be just outside of Minneapolis, MN in a town called St. Louis Park, MN. Do you know where that is? I have no clue, but I'm coming anyway! I can't wait to meet decor8 and Decorate readers AND I'll be doing a mood board presentation and talking about how to gather information and use it in a way that results in actual projects getting DONE and not constantly "in progress"! RSVP: Yes, please! 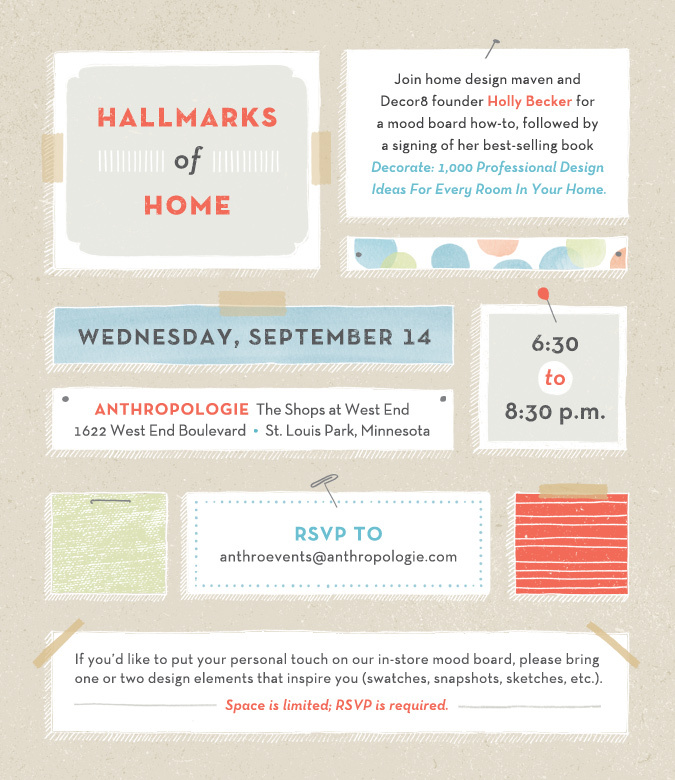 anthroevents@anthropologie.com with subject: Decorate Event in MN. Thank you! See you soon, midwest!